The artist was to play the role of theurgist. "From the very beginning, the Symbolist is a theurgist, in other words, a possessor of the secret knowledge with the secret action behind it,"1 Blok wrote in 1910 . "We are the few who know, i.e. 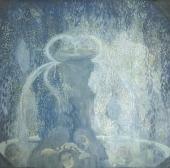 Symbolists"2. The cornerstone of the new art was "two-worldism" - the combination of two elements: the empirical and intuitive, perceivable through the senses, and the unperceivable. Music was the art best suited to express things inexpressible and inscrutable; characterising a painting as musical was the highest praise that could be bestowed on a work of visual art. Melody, harmony, rhythm, and the tonality of colours, lines and forms were the most appropriate transmitters of the essence, the spirit. M usicality did not refer to the author's engagement with music as an individual: according to his contemporaries, Alexander Blok, who often used the word "music" in his literary works (like his widely-known phrase, "Listen to the music of the revolution"), did not even have an ear for music. Musicality meant the expression of a work's content and also referenced this work's formal properties. Given this musicality, the language of Symbolism was rich in suggestiveness. Art with its credo, "Beauty will save the world", was again aspiring to beauty. Like other countries in Europe, Russia was looking for an unique national beauty and a national style with original roots reaching back to the Middle Ages and a source in folk art. The preferred idiom of Symbolism in Russia was the Moderne, a national version of the era's new decorative style, called Art Nouveau, Jugendstil or Secession elsewhere in Europe. The new style wanted to be monumental, expressing the essence of its times and embracing all areas of life, from daily routines to religion. Architecture was to dominate, with painting and applied art stylistically and conceptually related to it. Symbolism used different styles, such as Impressionism and classicism. The impressionist element of light and air was especially suitable for the representation of the different, volatile and mysterious reality, whether the higher reality of the transcendental world, the borderline states of the psyche (like dreams, reveries, memories and visions), or the surreal atmosphere of myth, fairy tale or legend. Myth-making was one of the main objectives of Symbolism, as the poet Fyodor Sologub wrote: "I take a piece of raw and dirty life and make a legend from it, since I'm a poet." The symbolist imagery of nature gravitated towards the mood landscape, of which Isaac Levitan's "Eternal Rest" (1894) is an outstanding example. The Symbolists in their landscapes put as much emphasis on the artist's feelings and emotions, on reflections about things eternal, as well as insights into the mysterious soul of nature, as on actual realities. Although still expected to include an element of likeness, the portrait acquired new qualities too, as artists became more interested in their sitters' spiritual core and quintessence - the final reckoning of their model's life rhythm and fate - than in their character and social standing. Portraitists now focused on the face and the mask - either on the dualism of the individual's image, or on the dominance of one of these two aspects. Every narrative addressed had an imprint of the artist's own individuality. Artists were gaining insights into the soul of things, relying on their personal experiences and individual view of life. From this came the richness and diversity of the artwork, and the greater or lesser degree of its profundity. Some saw in the language of Symbolism an artistic technique expanding the boundaries of art, while for others it was an attempt to penetrate a different, higher reality. European Symbolism had an impact on its Russian counterpart. The two had common roots, including primarily the art of the Quattrocento painters Fra Angelico, Giotto and Botticelli, and the English Pre-Raphaelites, William Holman Hunt, Dante Gabriel Rossetti, John Everett Millais, and especially "the father of Symbolism", the French painter Pierre Puvis de chavannes. The Russian masters were attracted to those European painters whose worldview was closest to their own Russian mentality in its purity, naivety, sincerity and lyricism. Symbolism in Russia developed along the same broad lines as its international equivalents, but it also had a distinctive historical background and lineage which to a large degree defined its originality. For some Russian artists, the composition of"The Appearance of christ Before the People" (1837-57) by Alexander Ivanov (1806-1858) was the first symbolist accomplishment in Russian art: the artist Mikhail Nesterov saw an instance of mystical revelation captured in it. This painting became an ideal of sorts for realist painters from the "Peredvizhniki" (Wanderers) movement. Nikolai Ghe ("'What Is Truth?' christ and Pilate", 1890; "calvary", 1893), Nikolai Kramskoi ("christ in the Desert", 1872; "Laughter. Hail, King of Judah", 1877-82), Vasily Polenov ("christ and the Sinner", 1886; the Gospel series "Scenes from the Life of christ", 1896-1909) were among the artists who in their own way attempted to picture christ, the episodes of His earthly life, and the landscapes of the Holy Land. 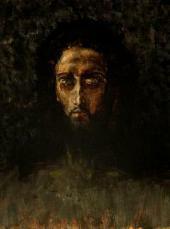 As realist artists, they humanised christ, representing Him as the best of men, created, like them, from flesh and blood. Thanks to Ivanov christianity became one of the sources of Russian Symbolism, not only in relation to the artefacts of Orthodox christianity such as icons and church murals, but also in painting and sculpture. Viktor Vasnetsov (1848-1926), who created realistic pictures of a magic world of fairy tales and sagas, considered Ivanov's Messiah the greatest christ ever. Vasnetsov strove to depict a universal, "pan-human", as well as a "Russian" christ, but like all the other "Peredvizhniki" realists, he was constrained by his attachment to lifelike forms. With his Slavophile focus and love for Russia, its nature and people, and his traditional christian Orthodox faith, Vasnetsov was one of the forerunners of the movement; he created a new style of church murals which, combining realism and academism, differed from the traditions of ancient icons and murals. creating images of saints, martyrs, prophets and the church fathers, he sought to express a national moral ideal, of which christ was the supreme embodiment. Within the Abramtsevo group of artists who gathered at Savva Mamontov's estate outside Moscow, Vasnetsov was in the vanguard of the search for a neo-Russian style. The art of Mikhail Nesterov (1862-1942) was in many ways influenced by Vasnetsov. Like Ivanov before him, Nesterov was determined to create a composition featuring the appearance of christ to the Russian people, but some of his attempts did not achieve the profundity for which the artist had hoped. Influenced by the European masters, the early Renaissance painters, the Pre-Raphaelites, Puvis de chavannes and Jules Bastien-Lepage, the strongest force nevertheless shaping his symbolist outlook was a personal mystical experience related to the early death of his beloved young wife. Nesterov's most artistically accomplished and profound piece, "The Vision of the Young Bartholomew" (1889-90) seamlessly combined lyrical imagery of Russia with an image of a different, higher reality, and revealed the mystical qualities of Russian nature. Such "otherworldliness" is felt especially strongly in his painting "The Murdered Tsarevich Dmitry". In his compositions featuring desert fathers, wanderers, monks and hermits in natural settings filled with Russian beauty, Nesterov created an image of Russia as a land of holy miracles, where man and nature are united in prayerful contemplation. "Glory to God in the highest, and on earth peace, good will toward men": the artist sought to tell the Russian people "the intimate word about them" through his artwork, paintings and church murals. One of his landmark works, originally titled "christians", or "Truth Seekers", was finally retitled "In Rus' (The People's Soul)" (1914-1916). In his peculiarly Russian manner Nesterov realised one of the innermost themes of Symbolism, the search for "the land of promise". That is the dominant subject of the art of Puvis de chavannes - humankind happy amidst a serene nature. Eager to spiritualise both nature and man, Nesterov transformed reality, made it incorporeal by employing mist-tinted colours diluted with white, simplifying, thinning out and lending rhythm to forms and lines, and using suggestive juxtapositions or contrasts. Nesterov's trademark compositional element is the fragile sapling, which introduces associations of poignancy and purity. Blok extolled his artistic idiom - "the magnificent colours and arabesque contours ravished from Eternity". 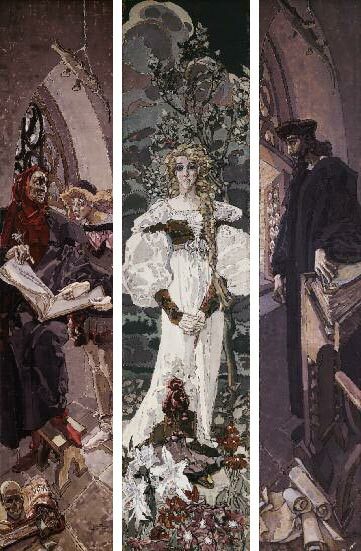 He described those other worlds using Vrubel's colours, "purplish-violet", "purplish-violet dusk", "blueish-violet mondial dusk"; Vrubel indeed created an individual, unequalled idiom, crystalline and luciferous, all attempts to imitate which have failed. The formation of this idiom was influenced by ancient christian art, the murals and icons in the cathedral of St. Sophia in Kiev, Byzantine mosaics, and Alexander Ivanov's series of Biblical watercolours from the 1840-1850s. In his murals in the church of St. cyril, and especially in his drafts for the murals in the cathedral of St. Vladimir (Volodymyr) in Kiev, Vrubel left us magnificent examples of his art filled with the most heartfelt tragedy of the Gospel. These works reveal Vrubel's singular artistic idiom, his mysterious world that seems to be lingering on the boundary between two ways of existence. All of the artist's pieces reflect his personal dramas. 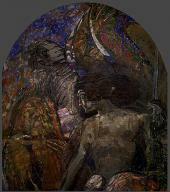 The icon "The Mother of God" features the face of Emilia Prakhova, the object of Vrubel's unrequited love. Vrubel's christ in "The Head of christ" (1888), a representation of the artist's rebellious and tragic spirit, is kin to his Demon. 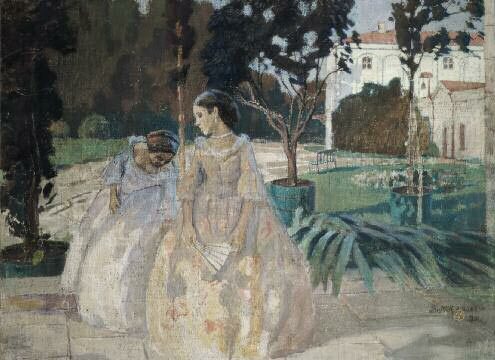 The fairy-tale and mythical images have a resemblance to his wife, the singer Nadezhda Zabela-Vrubel. In his series of "Demon" works ("Demon (Seated)", 1890; "Demon Flying", "Demon Downcast", 1902; the illustrations to Mikhail Lermon-tov's poem "The Demon" (1890-1891)) the figure is not an antithesis to christ. 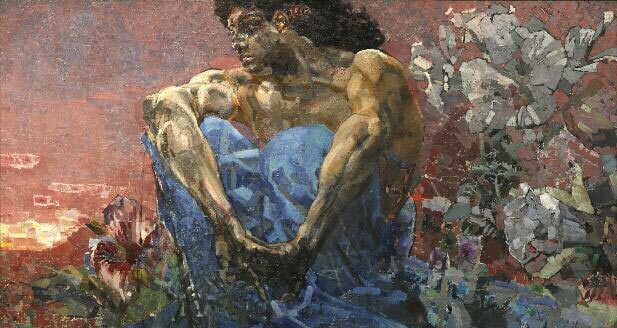 Vrubel conceived the Demon as neither a devil nor a Satan but a "human spirit, suffering and afflicted, but masterful and august". The artist created a romantic myth about beauty, might and the loneliness of the human being. At the core of this myth is the worldview of a great master chased by the mob, a pariah and outcast, a figure perishing but nevertheless preserving his fortitude and beauty. The Symbolists favoured the demonic theme because it enabled them to reflect on the eternal questions of good and evil, life and death, eternity and immortality. "Devils of every kind," in Leo Tolstoy's phrase, flooded the art world in the late-19th century. 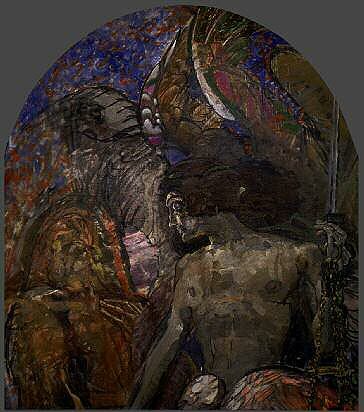 But Vrubel's Demon did not become an incarnation of evil: he is complex, profound, ambiguous and open to many interpretations - and therein lies his uniqueness. The connection between Vrubel's image and literature - in this case, Lermontov's poem "The Demon" - is significant for a symbolist piece, whether European or Russian in origin. While the "Peredvizhniki" artists were already using narratives from prose and verse in their compositions, the Symbolists preferred myths, legends and fairy tales. 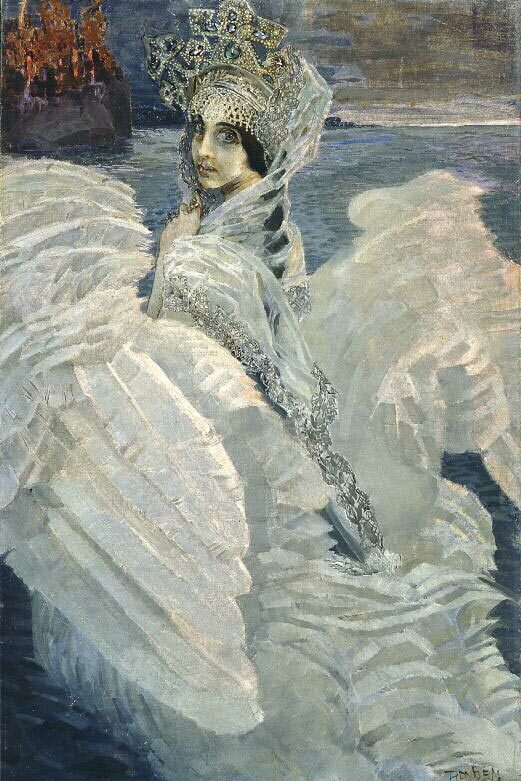 Vrubel's "The Swan Princess" (1904), "Pan" (1899), "The Faraway Princess" (1896), "Volha and Mikula" (1896) and "Bogatyr (The Knight)" (1898) were inspired by fairy tales and myths, and the artist felt the allure of mankind's "perennial companions" such as Faustus and Hamlet. Some of his pieces draw not only on literature but on music too, or more precisely on musical theatre. Vrubel contributed to the search for national beauty, creating in the Abramtsevo pottery majolica pieces themed on Russian fairy tales and sagas. The violet, golden, iridescent glazes were a manifestation of Vrubel's gift for applied art, lending his works a mirage-like volatility and mystery. Vrubel's tragic image of Savva Mamontov (1897) turned out to be almost prophetic about the future of this prodigious and gifted individual who proved himself in many areas of art, and was also an outstanding man of business who achieved a great deal for Russia but was destroyed by slander. Decorating Morozov's residence, Vrubel was able to achieve a true synthesis of the arts, combining architecture, painting and applied art. Vrubel remains the most notable and typical of the Russian Symbolists, approached in stature by Viktor Borisov-Musatov (1870-1905). Unlike Vrubel with his tragic art full of foreboding, Borisov-Musatov looked for his "land of promise" under the spell of Puvis de chavannes. Unlike his idol, who chose the idiom of classic forms and images to create his ideal world, Borisov-Musatov turned to Impressionism, using its techniques to capture the dreams and memories of bygone eras. The artist utilised the Impressionists' discoveries, including blue and green colours, coloured shadows, vibrant and neatly separated brushstrokes, and randomness of composition, to achieve his own goals - to create visual elegies, and to portray the spectral world of dreams and memories. 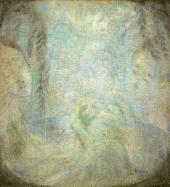 At the centre of his nostalgic pieces was a female figure - one of the favourite images of the symbolist artists. Borisov-Musatov depicts a not-immediately-beautiful modern woman, a wife, sister, friend ("Harmony", 1900; "Tapestry", 1901; "Pond", 1902-03; "Ghosts", 1903). 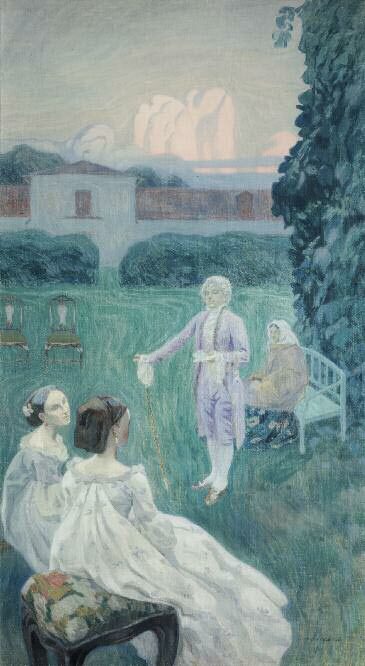 Old-fashioned clothes cannot conceal either her modesty and plainness or her inexplicable poetic charm, while the background of the artist's compositions feature old country estates and parks. 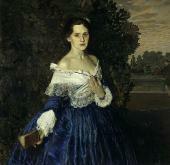 Like many of his contemporaries, Borisov-Musatov aimed at the grand style in his art. He got over the Impressionists' preoccupation with nature and turned his paintings into large decorative pictures, flattened like fresco, cadenced, and filled with the complex movements of women's bodies - either accelerating or slowing down, put on hold, and sometimes repeated in the rhythms of the fauna. He paid special attention to the texture of the canvas, integrating its decorative features into the imagery, and the inter-weave of threads, into which seemingly faded colours are rubbed, resembles old tapestry. The artist swapped the materiality of working in oil paints for soft distemper free of vulgar lustre and brightness. Borisov-Musatov's artwork did not draw on literature, and his pieces did not usually feature any elaborate story; musical terms are best suited to describe the artist's works, which carry a complex, evolving sense of melody, harmony and motif: the artist himself called his compositions "a melody of old-time sadness". The critic Sergei Makovsky called the artists of the "World of Art" group dreamers about the past, or "retrospective dreamers". connoisseurs of styles both old and modern, the artists, who published a magazine with the same title as their group, wanted to introduce to Russian society the newest trends of world culture, including Symbolism. In a landmark article, "complicated Questions"7, Sergei Diaghilev, who was the driving force behind the group and the magazine (and later the "Ballets Russes" dance company), said that Dostoyevsky, Wagner and Puvis de chavannes should be put on a par with the old Gods -Giotto, Shakespeare and Bach. The magazine ran articles about the English, French and Scandinavian Symbolists, including James Whistler, Puvis de chavannes, Edvard Munch, Aubrey Beardsley and others. The contributors included Symbolist writers such as Dmitry Merezhkovsky, Zinaida Gippius, Vasily Rozanov, Andrei Bely and Valery Bryusov, although there was considerable discord among these seekers of religious truths, writers and aesthetically-minded artists who founded the publication. The writers disliked the absence of mysticism, the artists' god-lessness, and search for beauty as the ultimate goal of art. "A Beautiful Line" was one of the tentative names offered for the "World of Art" magazine when it was being revived in 1910. The leading artists of this circle - Alexander Benois (1870-1960), Leon Bakst (1866-1924), Konstantin Somov (1869-1939) and Mstislav Do-buzhinsky (1875-1957) - were universally gifted: graphic artists, book designers, designers of monuments, applied artists, stage designers, writers and art critics, they were all eager to create "beautiful entireties", to synthesise the arts in a single work of art. They were able to achieve such desired results in book design and on the theatrical stage: "The Bronze Horseman" by Pushkin and Benois, "White Nights" by Do-stoevsky and Dobuzhinsky became landmark projects synthesising typography and art. At the centre of each of these books was their beloved St. Petersburg, a city endowed with its own mystical soul which could influence the destiny of the individual. In their low-key graphic works the artists sought the beauty of the past, engaging with the European, post-Petrine period of Russia's development. They were attracted not by great historical accomplishments but, rather, by "anecdotes of bygone times", promenading dignitaries, monarchs, Tsars and Tsarinas against the backdrop of old-fashioned architecture and well-ordered parks. 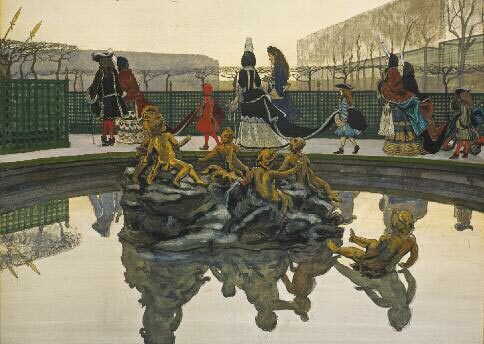 Versailles, Louis XlV's palace that represented a classicist ensemble of architecture and nature arranged within its park, was for Alexander Benois "a land of promise", or rather, "a beautiful entirety", admiringly depicted in the pieces from his Versailles series like "A Versailles Fantasy" (1906) and "A King Walking". Ironically-deformed small human figures inhabiting these landscapes were contrasted with the augustness, austerity and clarity of classicism. The abstraction typical for the language of graphic art lent to these little scenes a mirage-like quality, while the irony characteristic of the worldview of the artists of this circle undermined faith in miracles. 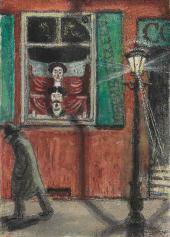 Their narrative paintings were characterised by their contemporaries as "lyrical grotesque". In Somov's "Echo of Past Time" (1903) the artist dwells with admiration on the details of the nobility's old-fashioned household routines or different curios, such as a little cushion embroidered with a dog pattern. 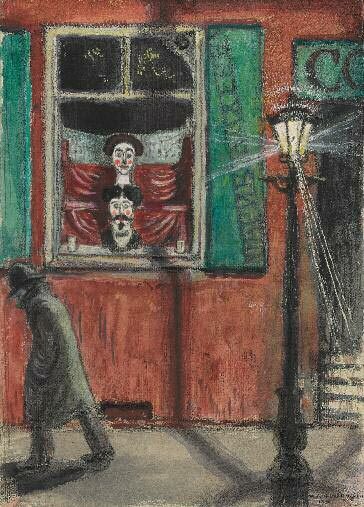 The "World of Art" painters enjoyed all types of "scurrilo-usness", which meant for them amusing and piquant details. Somov's "Lady in a Blue Dress" (Portrait of Yelizaveta Martynova, 1897-1900) is a portrait typical for Symbolism, as the artist transforms the modern woman by dressing her in a dress with a hooped skirt and depicting her in an old park; the woman's face nevertheless has features typical for the character and inner world of people living in the late 19th century. As an artist Mstislav Dobuzhinsky had the closest ties to Symbolism: having paid his dues, like the other "World of Art" masters, to the cult of old St. Petersburg and created his share of images extolling the city's augustness and harmony, Dobuzhinsky later discovered for himself the city's seamy side, which struck him as very bleak. In cityscapes featuring St. Petersburg, Wilna (Vilnius) and London from the "city Dreams" series of fantastic images, the artist was able to convey the souls of these cities as mysterious and sinister, hostile to people. The images were made all the more compelling by the antics and whims of the cities themselves - brick firewalls, blind walls and endless enclosures, wastelands, interior courtyards, crude shop signs and shop fronts, sinister or inane inscriptions, lanterns, and contrasts of the new and old. The artist saw a bitter poetry and mystery in all this: Dobuzhinsky highlighted the risks of a future technology-driven civilisation, contrasting machines vested with souls to crowds of uniformly faceless humans. His expressive graphic pieces look mysterious and bizarre, as he based his compositions on unusual viewpoints, strange angles, combined with the poetics of suggestion and allusion (the favourite technique of the "World of Art" group). The artist himself talked about his innate ability to discern behind ordinary objects some hidden, vague, mysterious images. Many of Anna Ostroumova-Lebedeva's prints also featured the image of St. Petersburg as a gorgeous city, frozen in time and eternal. Symbolism was fraught with anticipation of the great cataclysms of the 20th century. The 1905 revolution and its consequences posed the question of what lay ahead for Russia, to which the "World of Art" painters tried to give an answer in their works. Leon Bakst in "Terror Anti-quus" represented the goddess of love Aphrodite against the backdrop of a raging storm, while Dobuzhinsky in his large composition "A Kiss" featured a pair of lovers in a crumbling city, also prophesying the victory of love and beauty in a world falling apart. 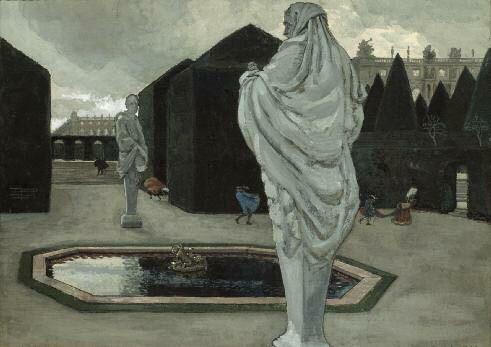 Benois and Somov imaged death appearing in the mask of Harlequin or in a black robe during a sumptuous banquet or merry masquerade. Symbolism, its worldview and idiom influenced the "World of Art" artists, although the latter movement was more engaged in aesthetic game-playing than achieving genuine insights into the world's varied profundities. A conscious attempt to engage with Symbolism was undertaken by artists from the "Blue Rose" group; titled after a 1907 group exhibition held in Samara, its name expressed the romantic leanings of the young painters who comprised its members. At the group's core were the artists Pavel Kuznetsov and Pyotr Utkin and the sculptor Alexander Mat-veev, while other members included Serge Sudeikin, Nikolai Sapunov, Anatoly Arapov, Nikolai Feofilaktov, figures who differed both in talent and in their artistic orientation. Kuznetsov (1878-1968) was a student of Borisov-Musatov (under whose tutelage Utkin and Matveev also studied) and the most gifted of these artists, and began his career by following up on and developing the older artist's ideas. In his vague and cryptic mystical images that defy attempts at deciphering them without reliance on prompts such as the pictures' titles, Kuznetsov depicted a spectral world which had almost no counterpart in reality. The themes of his pictures were motherhood, childhood, unborn infants: "The blue kingdom of unborn infants" is the name of one of the episodes of Maurice Maeterlinck's play "The Blue Bird". 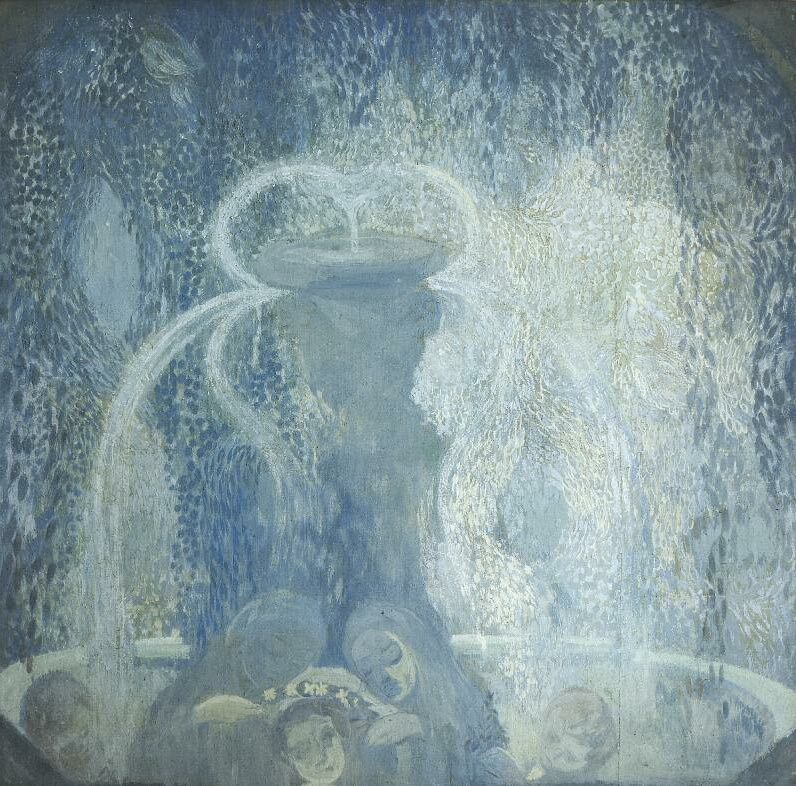 "Blue Fountain" (1905) is the best piece of Kuznetsov's symbolist period, displaying characteristic elements of Kuznetsov's artistic vocabulary like his bent for large decorative compositions in the Moderne style - square, flattened and ornamental, with diverse arabesque patterns and fluid curves. Kuznetsov's colour schemes are dominated by dark blue, blue, violet hues, which had become, after Vrubel and Borisov-Musatov, traditional techniques for conveying a sense of mystery. The decorative beauty of the compositions combines with the deformed faces of the human figures the artist depicted to enhance the mysteriousness and weirdness of his otherworldly realities. The painter's fixation on the imagery of flowing water appears to have been brought on by the motif of the wave, a key element in the Moderne. Working with Utkin and Matveev, Kuznetsov accomplished a synthesis of the arts when the trio created the decorative murals for Yakov Zhukovsky's villa in Novy Kuchuk-Koi in Old crimea. The Symbolist artists expressed anxieties about Russia's destinies, attempted to unriddle the secret signs of fate, and to find the right signposts. Symbolism has not disappeared altogether. Like other great art trends, it has become a classic treasure of the heritage of world art. Blok, Alexander. 'On the Present condition of Russian Symbolism'. In: Blok, Alexander. Works. Vol. 5. Moscow-Leningrad: 1962. 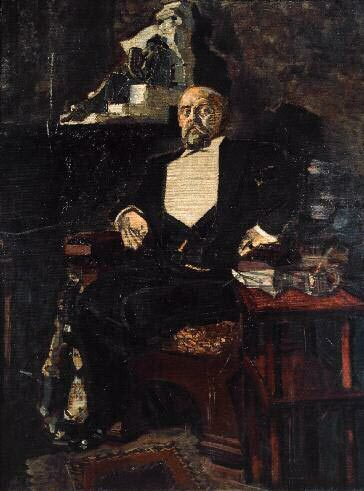 Diaghilev, Sergei. 'complicated questions'. "World of Art" magazine. 1889. Nos. 1-2, 3-4.